My husband Alan and I moved from Brisbane to Chiang Mai, Thailand, to try it out as an overseas retirement destination. The plan was to stay for six months to see if life here suited us. We’ve been here over a year now so it’s safe to say it certainly does. Since moving to Chiang Mai we have made many new friends, our days are taken up with a variety of activities and, thanks to the low costs, we have a quality of life here that wouldn’t be possible in Australia. Here we can afford the little luxuries in life that we never did in Australia, such as leg massages for $8, which leave us in a blissful state. I get manicure, pedicure and gel nails for $30 and my hands and feet look simply gorgeous. We both get our hair cut for $7 each. Although we love our life in Thailand, nothing compares to Christmas in Australia, so we were excited to be going home to spend time with our loved ones and sample all the familiar treats that make up an Aussie Christmas. Loaded with luggage we decided to take a taxi from the airport to central Brisbane. While driving into the city, we watched in horror as the meter flipped over with alarming speed. Reaching our destination, we were shell-shocked by the $69 cab fare. A huge difference to the 75 cent Songthaew (red bus) rides we take around Chiang Mai. Eating out was our next surprise when we met up with our son for lunch. We ordered two serves of cheesy garlic bread, one chicken caesar salad, four soft drinks and two beers…and it came to a grand total of $79. In Chiang Mai, Thai food costs between $1.70 to $5.50—depending on what kind of restaurant you go to—so we eat out at least once a day. On the rare night in, we buy a delicious Pad Thai from our local street cart for $1.15 or visit the local market for take away meals from as little as 75 cents. Western cuisine is more expensive, for example we pay $5.50 for a chicken caesar salad and $15 for a steak at one of our favourite local restaurants. A cappuccino costs around $2.40. Beer costs around $3.25 at a restaurant and $1.35 at the convenience store. Cocktails vary in price but can cost as little as $3.80. And it’s not just dining out that’s so much more affordable in Thailand. The internet is a dream in Chiang Mai, with unlimited downloads. Since returning to Australia we have had to remind ourselves to download less after accidently going through 4GB mobile access in a week. 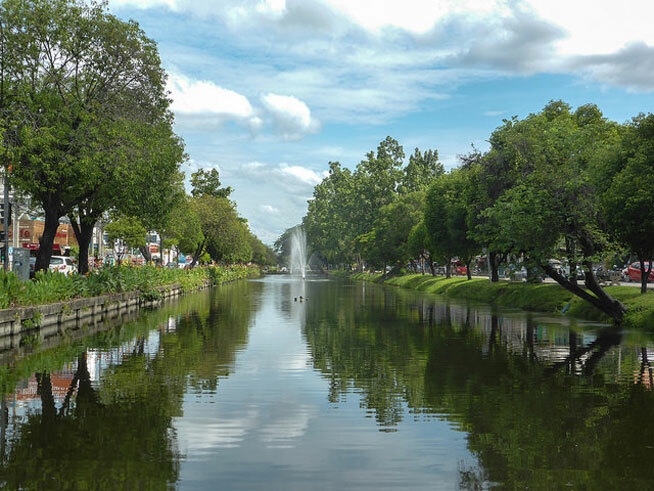 Aside from the low costs, another reason Chiang Mai is such an attractive retirement destination is the thriving expat community. Through Chiang Mai Expats Club, we not only found the transition to living in a new country easier but also made many new friends. We’re also involved in activities such as a card club and computer club and attend various social gatherings with the group. We lead a busy life in Chiang Mai and find it very fulfilling. So, as much as we’ve enjoyed Christmas in Australia, we’re happy to be heading back to Chiang Mai. In fact, we’re loving our new life there so much we pinch ourselves every day to make sure we aren’t dreaming!